Can this necklace help more kids get vaccinated? It looks like a normal necklace. Just a small, clear plastic droplet dangling from a thick black thread. It's actually a tiny digital health record, able to track a baby's immunizations in locations where recorded medical histories are patchy at best. 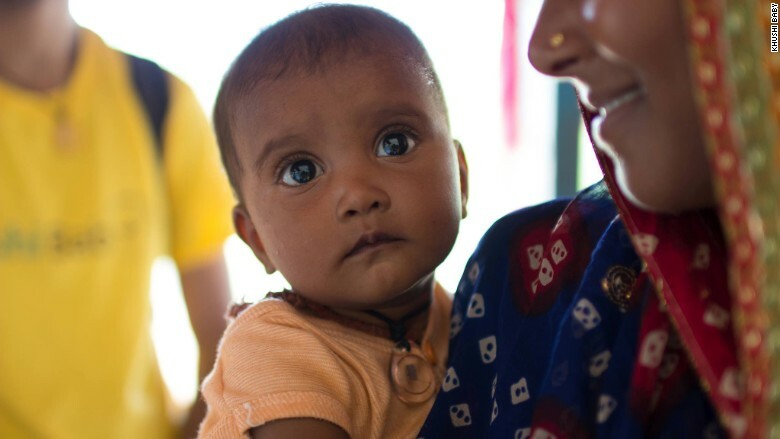 Called Khushi Baby, the necklace is one of two winners in the Wearables for Good competition put on by UNICEF, Frog design and chip-maker ARM (ARMH). Launched in early 2015, the contest looks for wearable tech that can help mothers and children in developing countries. Wearables are usually thought of as sleek fitness trackers or pricey smart watches. UNICEF wanted to find new uses for the tech that could help save lives. Submissions for the contest needed to be low cost, rugged, low power and scalable. 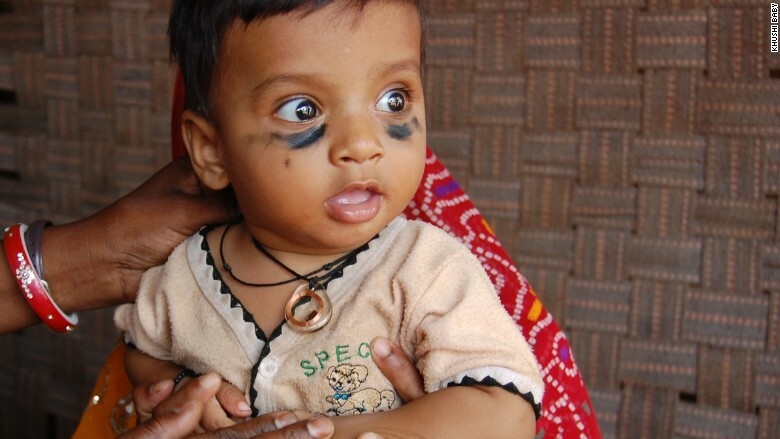 The Khushi Baby necklace is already being tested with 300 children in villages in Udaipur, Rajasthan, India. Currently, vaccines are tracked using paper cards, which are often lost or not filled out. Vaccine rates in many remote villages are frequently low. The Khushi Baby team wants to give the necklaces to babies to start changing that. The villages don't have doctors, so NGOs travel to the locations and set up temporary camps. The visiting doctors can scan the necklaces using a smartphone app and instantly see a history of the patient's shots. Another scan would update the chip with their most recent shots. When the doctors are near an Internet connection again, the electronic records, along with the child's name and mother's phone number, are recorded and uploaded to the cloud. Mothers get an automated phone call, in their dialect, to remind them of any upcoming shots. And health officials can access the data to better track vaccines across the country. "You're really changing the nature of who owns that data and how it gets stored," said Denise Gershbein, Frog's executive creative director. "It's really in the hands of the mother and her child." One of the device's most interesting innovations is decidedly low-tech. In India, black threads symbolize protection, and many children already wear them. The hope is that the black thread will help boost vaccines rates when parents might otherwise be wary of doctors. The contest received 250 entries and picked two winners. One finalist imagined a modular wearable sensor that could be customized by a doctor for each patient. Another designed a water purification device worn on the wrist. The other winner is SoaPen, a crayon that helps kids wash their hands. The crayon itself is made out of soap. A teacher uses it to draw on kids hands. The kids then wash their hands to remove the drawing, no extra soap needed, killing germs and improving their health at the same time. In January, SoaPen and Khushi Baby will work with mentors at Frog, UNICEF and ARM on their projects to improve the designs, create prototypes and manufacture their products. They'll also receive $15,000 and be connected with partners in the field that can help take their projects to the next level.